Land of Israel activists hail Sunday's vote by Likud party in favor of sovereignty over Judea and Samaria as 'historic' move. Activists from Israel’s Sovereignty Movement praised the Likud Sunday evening, as the party’s central committee voted unanimously to back a measure endorsing the application of Israeli sovereignty over Judea and Samaria. 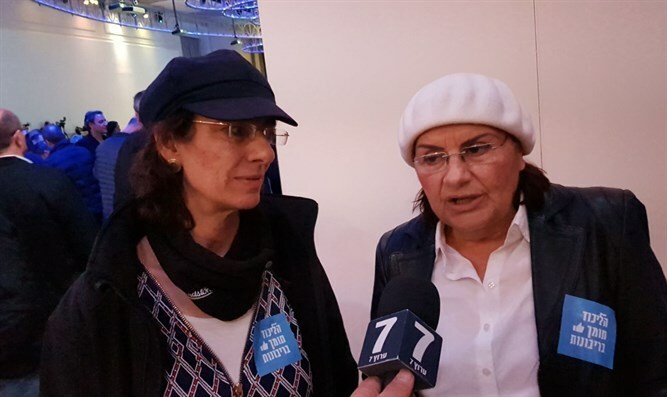 Speaking with Arutz Sheva Sunday night, Women In Green cofounder Nadia Matar said the largely symbolic vote was an important step towards her organization’s goal of extending Israeli sovereignty over all of Judea and Samaria. "Tonight is a really historical evening. The Likud for over 12 years... had no ideological gathering,” said Matar, referring to a 2005 vote by the Likud Central Committee opposing then-Prime Minister Ariel Sharon’s planned demolition of 25 Israeli towns in the Gaza Strip and northern Samaria. “This is an ideological evening in which the Likud's Central Committee is going to vote in favor of the application of Israeli sovereignty over Judea and Samaria. It is really historical. We, the Sovereignty Movement, founded by Women In Green, came to strengthen, support, and thank the Likud for this special evening." Some 1,500 of the party’s 3,000 central committee members gathered for the special meeting at the Avenue Conference Center near Ben Gurion Airport in central Israel. The meeting was called after 900 members of the central committee signed a petition calling for a debate and vote on the proposal. "You can only get to the practical after you get to the declarative also,” added Matar. “The declarative will bring about the practical also. And we certainly are very moved to hear all the ministers. We just hear [Tourism] Minister Yariv Levin calling for the application of Israeli sovereignty over all of Judea and Samaria. We believe that the declarative will become practical also."